More raw goodness is heading your way with our new Sour Cherry & Hazelnut Raw Bar; a delightful 100% raw slice made from squished fruit, nuts and seeds. After the storming success of our Apple & Pecan Raw Bar we thought it was time to create another flavour combination, mixing together lots of healthy goodies in one tasty bar. This time we've matched the deliciously tart, yet sweet, sour cherry with a complementary nutty taste. Hazelnut, with its rich almost creamy taste, was a perfect match. The good news is our roar nut monster Hazel has confirmed its great taste. The even better news is it's NCGI, with no added sugar in sight. And the best news of all? 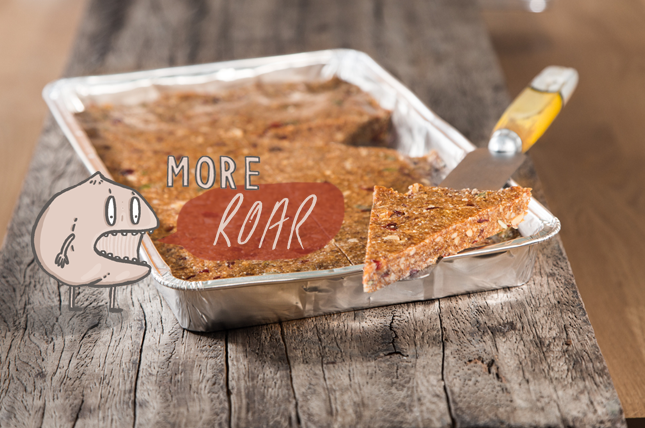 You'll be able to order your first tray for £8 by entering ROAR at checkout. In true Olympic style, Hazel will be racing you to the order line. Ready, Set, GO. ORDER NOW.